Click to view Brafton’s infographic archive. Infographics are visual displays used to share data, expertise and/or trends in a logical format that conveys a story. They are a product of design and editorial efforts. 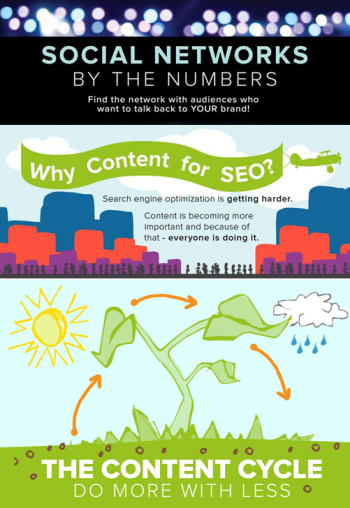 The Content Marketing Institute’s B2B Brand report for 2015 said 62 percent of marketing strategies include infographics, making it the fastest growing content format. The information included in an infographic will depend on the story that a brand, publication, content writer and/or graphic designer strives to tell. Infographics may include industry-specific statistics, consultancy tips, quotations, complex concepts, funny ideas, top 10 lists according to sector or a number of other types of information. The content may be represented in the form of charts, animated characters, creative themes and more. Regardless of the type of information and artistic design an infographic takes on, it is important that the concept be original, well-researched and executed in a visual style that is appropriate to the content. The design must tell a cohesive narrative to distinguish an infographic from other forms of art. The content and correlating visual execution of an infographic should reflect the personality of the sponsoring brand. Additionally, brands may opt for a color palette that is consistent with their branding as well as the inclusion of a logo on the design for instant recognition. Developing attractive, informative infographics is an ideal component of content marketing campaigns as infographics are proving to be highly engaging and are frequently shared across the web.